The objective of the project is to set up an electronic (computer) Information and Resource Center Network to meet the information resource requirements of the small enterprise sector including small industries and industry related service and business activities. This objective will be achieved by setting up an information network on small enterprises to be called the Small Enterprise Network-SENET. 1) To create and facilitate creation and provide and facilitate access to useful information to the target group of small enterprises in electronic (computer) form over a network to be run on NICNET. 2) To create and facilitate creation of appropriate databases of use to the small enterprises and other target groups in their decision-making processes. 3) To facilitate and promote a network alliance of information servers catering to the small enterprise sector. This facilitates sharing information among the relevant institutions in mutually beneficial and cost-effective manner. 4) To provide technical know-how and package assistance to information servers feeding the information needs of the small enterprises. The information servers may include institutions both in the public and private domain as well as commercial entities like consultancy companies, data base providers and information software companies. The assistance would be in the form of accessing and disseminating their information as well as commissioning appropriate information projects for implementation on the SENET. 5) To provide appropriate training inputs to the personnel in the DC (MSME) and its associate institutions to serve as professional information providers in dispersed settings all over the country. 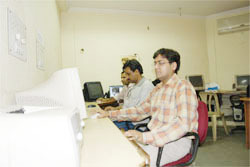 6) To provide an all India and decentralized information network in the form of SENET for promoting both placing of information as well as accessing information by interested institutions and groups such as State Governments, Directorate of Industries, DICs, State Industries Development Corporations, SFCs, Technology Institutions, CSIR laboratories, industry associations and NGOs. B) It will provide information regarding cluster group of industries including details of technologies, list of suppliers of machines and raw materials, quality status and availability of consultants etc. 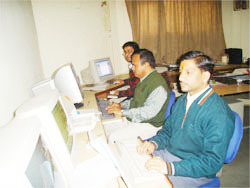 C) TRC have developed computerised set-up, which has net-working facilities with the apex organisation of technology upgradation. D) It will have collection of technical books, lists, brochures etc., which will be available in the library of the institute.